A method of hydrophilic interaction chromatography (HILIC) combined with indirect ultraviolet detection was developed for the determination of piperidinium ionic liquid cations. The factors affecting the retention of piperidinium cations (N-methyl-N-butyl piperidinium, [MBPi]+; N-methyl-N-propyl piperidinium, [MPPi]+; N-methyl-N-ethyl piperidinium, [MEPi]+) were investigated and the retention mechanism of piperidinium cations on HILIC column was discussed. The retention behavior of piperidinium cations on HILIC column had typical HILIC characteristics and their retention followed the carbon number rule. Imidazolium ionic liquids mainly played the roles of background ultraviolet absorption reagents and eluents. The resolution between [MBPi]+ and [MPPi]+ was 3.2 and the resolution between [MPPi]+ and [MEPi]+ was 2.4. The detection limits of cations were 0.22–0.36 mg/L. 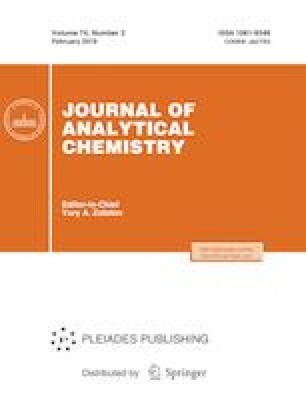 The method was applicable for the analysis of piperidinium ionic liquid samples synthesized in chemistry laboratories. The recoveries after spiking were 93.4–98.9%. The method is simple, accurate and practicable. This work was supported by the Natural Science Foundation of Heilongjiang Province (Grant no. B201307).